Today I bring you a very special post! 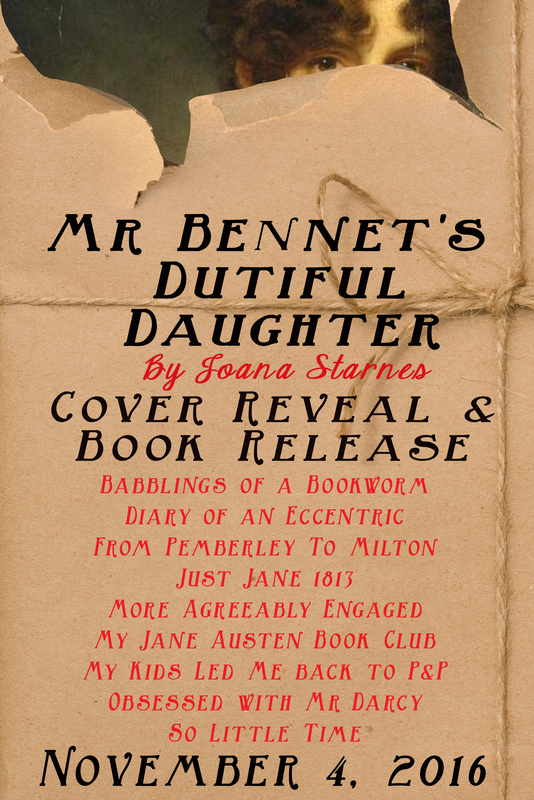 Along with 9 other wonderful bloggers, I’m happy to reveal to all of you the cover for Joana Starnes newest book, Mr. Bennet’s Dutiful Daughter! Along with the cover, I would like to share with you some fun facts I discovered while doing my research for this post, the book blurb and…a giveaway sponsored by Joana Starnes. Joana’s new book has a very beautiful portrait on it’s cover, it is titled Portrait of Miss Frances Vinicombe, date unknown, and it’s an oil on canvas that measures 92×71 cm painted by John Opie, a Cornish historical and portrait painter. He painted many great men and women of his day, including members of the British Royal Family, and others who were most notable in the artistic and literary professions. One of the people he painted was Mary Wollstonecraft who was an English writer, philosopher, and advocate of women’s rights. During her brief career, she wrote novels, treatises, a travel narrative, a history of the French Revolution, a conduct book, and a children’s book. Wollstonecraft is best known for A Vindication of the Rights of Woman (1792), in which she argues that women are not naturally inferior to men, but appear to be only because they lack education. She suggests that both men and women should be treated as rational beings and imagines a social order founded on reason. Wollstonecraft died at the age of 38, eleven days after giving birth to her second daughter, leaving behind several unfinished manuscripts. This daughter, Mary Wollstonecraft Godwin, became an accomplished writer herself, as Mary Shelley, the author of Frankenstein. 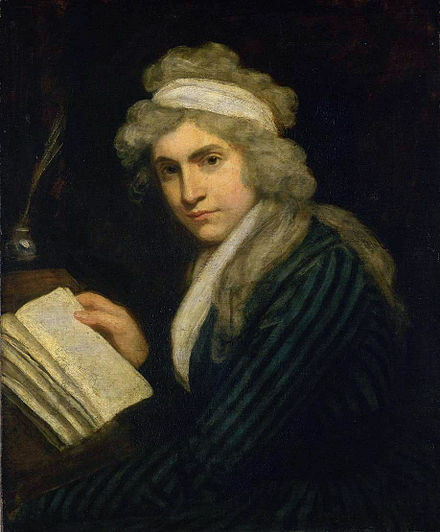 I believe Mary Wollstonecraft’s life story and beliefs would make her a perfect Elizabeth Bennet, but John Opie painted her in a later stage of her life so the person on Joana’s book cover is not Mary Wollstonecraft but Miss Frances Vinicombe. I tried to obtain more information on her, but I couldn’t find much. I know she was born in Devon, England ans she was painted in mourning clothes but everything else remains a mystery. I guess that is a good thing isn’t it? We will not have any prejudice concerning the cover as we will be left with only our own imagination and creativity. Every time we look at Mr. Bennet’s Dutiful Daughter we may imagine what type of live that beautiful woman may have had. What do you think? Miss Frances Vinicombe was a better choice for the cover wasn’t she? I am very intrigued by the painting on the cover, especially by the clothes Miss Vinecombe is wearing. Why is she wearing black? Where was she when this portrait was painted? Who ordered this painting, and where was it kept? I’m not sure if I will ever know the answers to these questions, but at least some might be answered if I ever visit Russia. And, no, that was not a mistake, the painting is currently on display at The Hermitage Museum in Russia, so if you ever visit St. Petersburg, you’ll have a chance to look at the intriguing Miss Vinecombe. You can also find in this museum paintings of some of my favorite artists such as Van Gogh, Camille Pissarro, Paul Cézanne, and Alfred Sisley, but also from Degas, Gaugin, Renoir, Monet, Picasso, , Kandinsky and so on. But I’m digressing and by now I already spoiled who Mr. Bennet’s Dutiful Daughter is, but in case you are still wondering why Elizabeth Bennet is a Dutiful Daughter, please read the book blurb. This book will go on a tour, don’t miss the several stops to find out more about it, and have an extra chance at the giveaways! 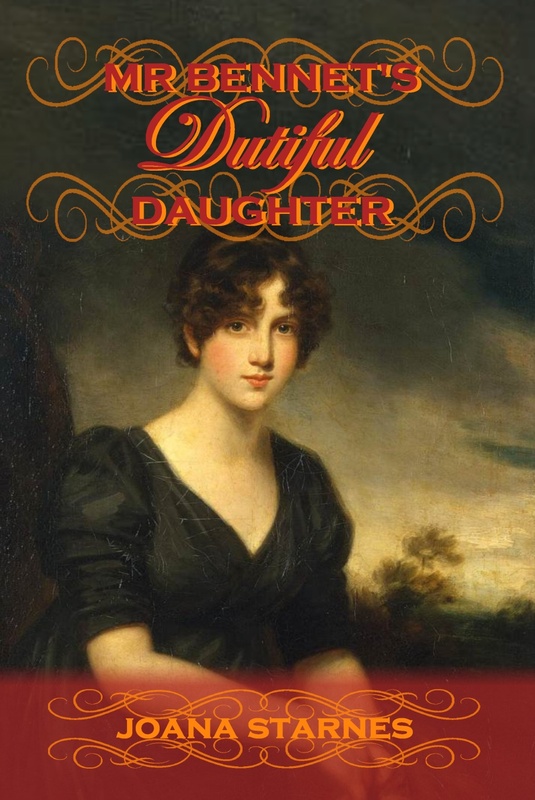 Joana Starnes would like to offer our readers 3 copies of Mr. Bennet’s Dutiful Daughter. One reader will receive a paperback and two will receive an ebook copy. They will also receive assorted Austen-related mini-gifts. The giveaways are open to international winners. Also, as a special bonus, all Rafflecopter entrants will receive an exclusive excerpt of the book that will not be included in the Amazon sample. To enter the giveaway, just click here. I wouldn’t say I am a cover addict, but I do love it when a cover grabs my attention and has a strong connection to the story. Neat to learn about the painting and the painter for the cover. It’s lovely and her face is captivating. I’m so glad you liked both the blurb and the cover, Sophia Rose! I really can’t thank Claudine enough for discovering this beautiful portrait! Aww Rita you’re too kind!! Off on a tangent here, but you do realise that your ARC quote is going to have to go on a banner on my website or somewhere 😀 😀 ‘Who am I kidding? Of course it can’ I loved that!!! I’m over the moon that you liked the book, that means SO much to me! Thank very much for another great giveaway. I hope I win a copy! Thanks for visiting, Marta. So glad you liked the post! Best of luck in the giveaway! The cover is simple but beautiful, thanks for sharing it, and fingers crossed for the giveaway. Oh, absolutely 😀 😀 If Mary W wasn’t so young, that frown might have made her look a bit like lady Catherine rather than Elizabeth. Thanks, I’m so glad you like the cover. Best wishes in the giveaway and fingers crossed indeed! Thanks so much, Rita and Kate! I have to say I had a jaw-dropping moment when I discovered the gent that went on the Falmouth Connection cover 🙂 And then another jaw-dropping moment a few weeks ago when Claudine introduced me to Miss Frances. Thanks for stopping by, Kate, and best of luck in the giveaway! A new Joana Starnes’ book to read!!! intriguing and I can’t wait to read it! Cover looks really fetching,a composed lady posing for this portrait,I cannot help but wonder at her carefully closeted feelings and thoughts! I really loved what she did with this story and I’m eager to post the review 🙂 I know for a fact you will love the book Mary. “I cannot help but wonder at her carefully closeted feelings and thoughts!” Wonderfully put, Mary! So true, that’s one of the reasons why I thought this portrait was so perfect, it really captures the essence of the book. I do hope you’ll like it and thanks for the wonderful words about my books! Thank you, Rita, ever so much!! I wish I could write with the speed of light, and I’m over the moon that you liked MBDD too! Can’t wait for your review and huge thanks for this great post and the awesome cover reveal! Fascinating post Rita and the potrait chosen is wonderful. Definitely much better than the one of Mary Woollstonecraft. I think we’d all be wondering why there was an elderly lady on the cover! Looking forward to reading today’s other posts too. Can we enter the Rafflecopter on each blog today or is it a case of one entry covers all? Oh, yes, much better that Mary Woollstonecraft’s (rather dour) portrait 🙂 Thanks ever so much for all your lovely comments on the cover reveals and the guessing game! Fingers crossed for a win and I hope you’ll like it! So sorry, can’t say over the top of my head how the Rafflecopter link works, but I’ll ask Claudine and let you know asap! Just beautiful! She is the perfect Elizabeth. I love the idea that Darcy and Elizabeth get married early on as well and just hope that Elizabeth isn’t too stubborn about her feelings (a vain hope I suppose!) I am really looking forward to reading this. 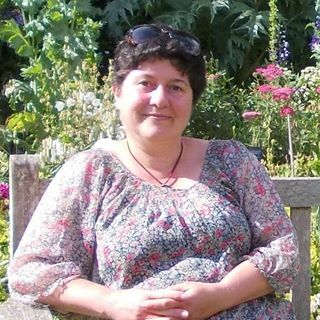 Huge thanks, Rita, for this great post and the amazing welcome, I’m absolutely overwhelmed!!! You and the other wonderful people hosting the cover reveal are just too kind for words!! : Rita, Anna, Ceri, Janet, Maria Grazia, Tamara, Mira, Margie, Candy and Claudine, THANK YOU! Fabulous choice for the cover. Can’t wait to read it! I love portraits and always enjoy the seeing the choices made by authors of their representation of Elizabeth or even Darcy. Thank you so much, Rita, for joining the cover reveal. I look forward to reading your review, especially after all the conversations we had enjoying this story! Thank you both, and all the other lovely people who co-hosted this amazing event!! Anything written by Joana I am buying if I don’t win. SO looking forward to reading this. Thanks SO much, Sheila, it’s so wonderful to hear you like my books! Best of luck, I hope you win and i can’t wait to hear what you thought of it!! I second Shelia’s comment! Love the cover, it’s beautiful! So glad you loved the cover, Dung, and thanks, I’m so happy to hear you like my books! Fingers crossed for a win and I hope you’ll like it!! The cover is beautiful and the correct woman was picked to represent Elizabeth Bennet. Thank you for the great history of Miss Vinicombe and am looking forward to reading Joana’s newest novel. She is always doing great research for all the novels and keeps you very interested while reading. I’m so glad you think so, MaryAnn! My thoughts entirely, this was such a fantastic fit for the Elizabeth of this book! Thanks for the wonderful words about my novels, I’m so happy you enjoyed them, and for visiting the cover reveal! Fingers crossed, Fla, and I hope you’ll like it. Best of luck! Me,me me! I gotta have it! Just send it right here! As always, I expect this book to be a terrific read. Joana’s books always are. That’s why you get such an eager beginning to my comment. Booboobooboo Conga! I just came from Ceri’s and I’m dancing my way around these blogs for the fun of this cover reveal party! What fun! Of course, it’s for Joana’s book, which if I had now, I wouldn’t be on the Internet, I’d be gobbling down as her books are amazing. Thanks for the party, Rita and Joana! Thanks, Suzan, for the kind words and the wonderful support. Lovely to see you at the cover reveal party, it’s so kind of you to come and dance the night away from UK to Portugal to NYC 🙂 All the best!! I like this painting and also wonder why she is wearing black. Will that be part of the story? I can’t wait to find out! I have enjoyed all of Joana’s books. It does give part of the outcome away from the very beginning, Kim, but it was worth it! I think this image of a bereaved young lady who is on guard against more distress is saying a lot about the story. Thanks, it’s so great to hear you enjoyed my other books! Hope you’ll like this one as well. Best of luck in the giveaway and thanks for taking part! A must read! (As all Joana’s books are! )I am intrigued! Congratulations! Thanks for the ever so kind words, Becky, and wonderful to hear you’re intrigued 🙂 Hope you’ll like the story when you get to read it.